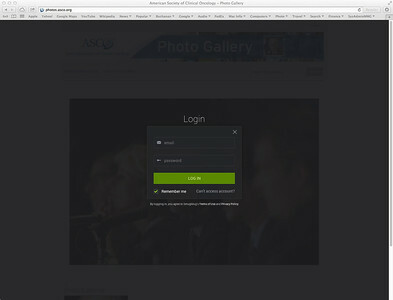 Log-in is located in the upper right corner and there is also a small log-in link at the bottom of the home page. Contact: Amy Thompson for the log-in information. Todd Buchanan @ MedMeetingImages can also help. 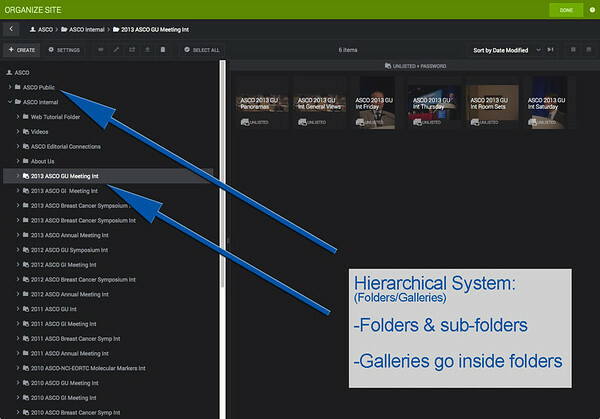 Smugmug uses a hierarchical folder/gallery system. Folders can be created and galleries can reside in those folders. 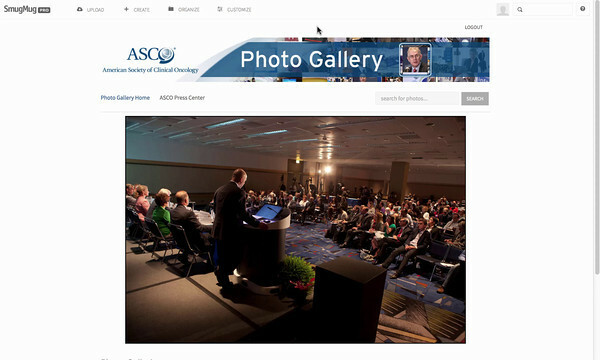 Galleries are where the images are placed and can be created by you. Generally, we try to group folders and galleries by Internal or Public. In each of those root folders, we group them by meeting, then by year. The galleries go into one of those folders. 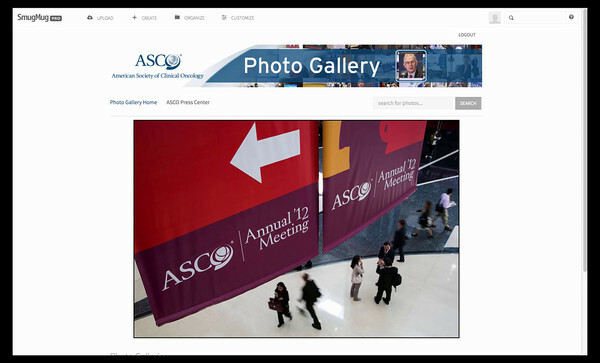 You can navigate to photos using the left and right arrows below the large thumbnail and you can jump from page to page of photos within a gallery using the arrows there or you can use the drop-down menu that shows you the number of pages for a gallery and select the page number you would like to go to. 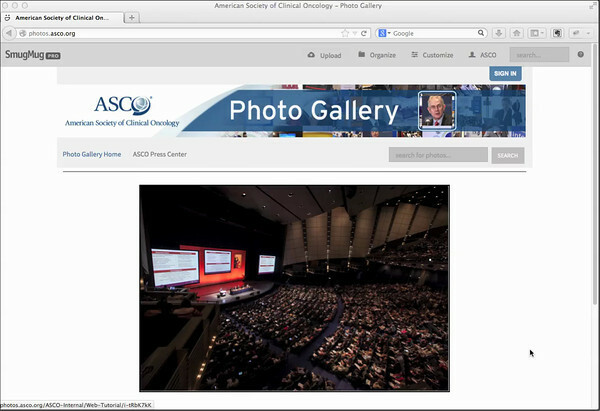 You have two options to see larger views: the "Lightbox" or the "Full screen slide show". To jump to Lightbox, just click on the larger view in the gallery page (It says "Click Image to Enlarge") and you can see a full browser window view. In the Lightbox mode, there are tools available in the lower right corner. They include the "Tools" (same as the gallery page), "Share" (the same as the Gallery page) and one option that allows you to see different views. With the different size views, you can get smaller versions of images by right clicking on the images. When you click create, you can then click on "Done" in the upper right corner of top green bar and it will take you to the page (that will not have any photos at the moment). Make it a "Smart Gallery"
Overview: Make a Keyword>Create a regular Gallery>Then make it "Smart"
This is the way the web database pulls photos that have the keyword you chose to embedd from an Internal gallery and adds them to a Public Gallery without having to re-upload or copy the images one at a time. MAKE IT UNIQUE WITH NUMBERS, LETTERS, UNDERSCORES, ETC! You can then proceed to paste that word into the Caption or Keyword field (via the Organizer/Caption editor) of the photos that you want to move to a public gallery. (or individually in Tools/Details and add to the Keyword field below the photo). 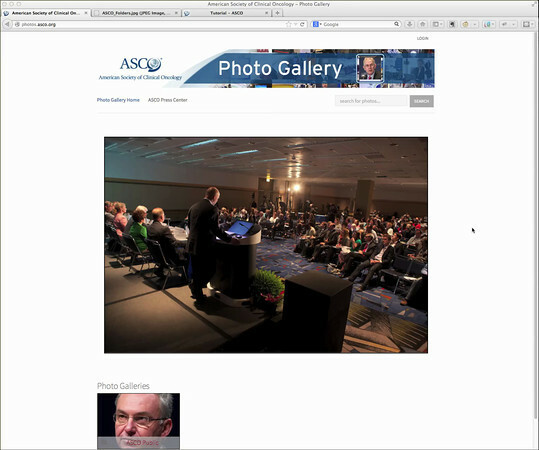 Creating a "Smart Gallery" means that it will pull images from the internal gallery (password protected area) and allows those images to be added to the new "Smart Gallery" that you can share with the public or media. 1> Create a keyword that you will place in the photos you want to be pulled into a smart gallery and then put that keyword in the keyword field of each photo you want to make available. 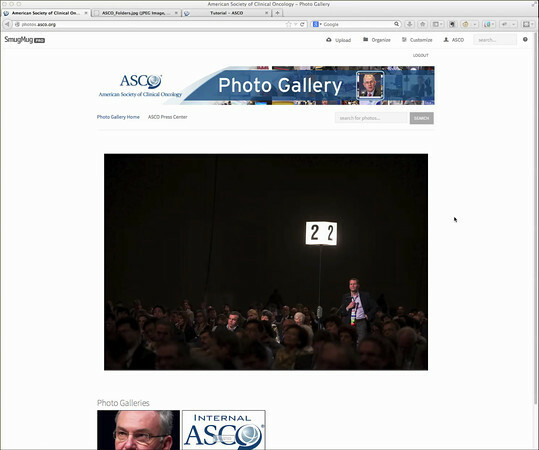 2> Go to "Organize" and then Create and Name your new (public or internal) gallery or navigate to one that already exists. After you have created it, go back in to the "Settings" and you will see an option on the left to make it a "Smart Gallery" in the tools panel. 3> Click on "Smart Gallery>Set-up" and enter the Keyword that you want to use into the keyword field. It should pull all the photos with this keyword into this new gallery. Then slide down to "Collect"
6> It will ask which gallery you want to move the photos to, so navigate to the gallery and click on "Done"
To download a photo from the photo gallery one-at-a-time, you can simply look in the lower right corner below the photo and click on "Download" and it will give you the option of where you want to download the image. In order to download all the images from a gallery, you have to navigate to "Organize" and the navigate to the specific gallery. Once you are at that gallery and see the images in the right hand panel, go to the controls accros the top and click on the "Download" option (A Downward Arrow over a bar). Overview:>Normal Gallery view>Click on "Tools">Select "Edit Details"
To just change one or two captions, you can edit from the normal gallery view using the "tools" below the photo on the right, go to >"Tools">"Edit Details" and that will give you both the Captions, Keywords and Title of the photo. You can make changes and save to keep the changes. 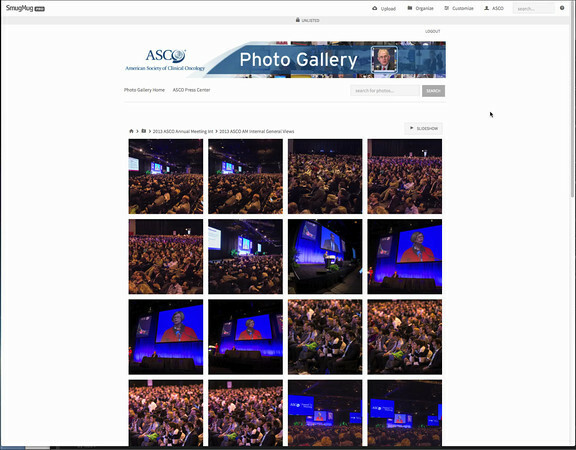 Overview: >"Organize">"Navigate to Gallery>Select "Tools">Select "Edit Captions"
You will click on the "Organize" tab at the top of the page and navigate to the gallery that you want to modify a group of images or the entire gallery. 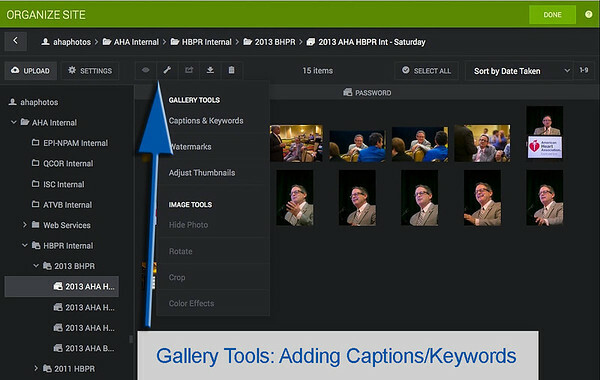 Once you see the images on the right hand panel, go to the tool bar at the top of the Organizer and select the tools and you will see the "Edit Captions". 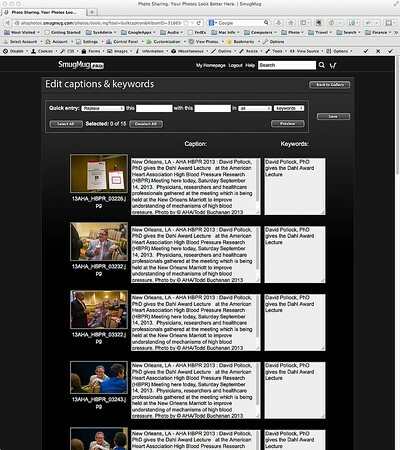 The dialog gives you a broad variety of options to edit the captions: add, replace, delete, etc. Make sure that you observe the lsat function which asks if you want to apply to keywors, captions or both....usually best to choose both...remember to select the images you want....you can select all or just click on the thumbnail of each image you want to edit (no need to right click or hold down the shift key). You can PREVIEW the changes you made before you select save. Note: It can take a minute or two depending on how many changes you made as it is updating the database. Searching for photos starts in the upper right hand with the "Search" box...It's pretty easy so begin by typing in the keywords that might get you closest to what you need. You can sort your images by date; veritcal or portrait; newest to oldest, etc....mix and match to taste. Note: If you are logged in, you will see more images than public galleries since the logged in ones are not available to outside/public users.